Molten glass – a mixture of quartz sand, soda ash, calcium carbonate, potassium carbonate and potassium nitrate – bubbles away at around 1,500 degrees Celsius, not unlike the primeval soup itself. 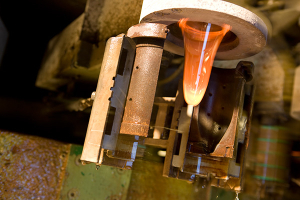 The liquid glass is portioned into drops (“gobs”) and shaped during the cooling process – blown into goblets, pressed into glass stems, cut by laser, joined and fused together. In just a few minutes, these incandescent liquid drops are transformed into high quality crystal glass. Innovative methods such as rim processing by laser, or the more traditional “blowing and grinding” as well as integrated quality assurance complete the automatic production procedures. 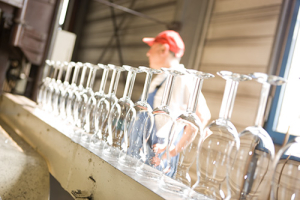 We are the only glass manufacturers in Europe to provide all the services needed for the development and production of glassware from a single source. 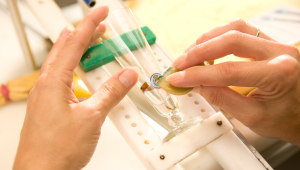 Perfect glasses are the visible result of comprehensive quality assurance, which is why we test and inspect our products throughout the entire manufacturing and finishing process. For example, selection of the first blanks takes place as soon as they come off the machine. Only bowls that come up to the strict standards assured by the practised eye of our experienced inspectors are allowed to advance to the second production stage, where the stem and foot are added. After screening in the cooling oven, the batches are subjected to further inspections using random sampling. Automatic testing stations measure up to fifteen different parameters of an individual glass and compare this data with pre-defined limit values. This is the only way to monitor the natural fluctuations in the quality of the glass – a notoriously difficult material to process – and ensure that the product stays within the specified tolerance limits. 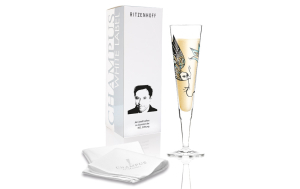 This ensures that each and every glass attains the high quality synonymous with the name RITZENHOFF. Our quality management processes also guarantee that the glasses we supply to our clients on all five continents are of the same high quality as those sold at home in Germany. In a word: quality, made by RITZENHOFF. One thing that hasn’t changed at RITZENHOFF AG is the focus on the production and decoration of drinks glasses for the beverage industry. In addition to the production and sale of glasses for the brewing and mineral water industry, the group has also established an important secondary source of revenue with the sale of RITZENHOFF brand products to specialist retailers. This division covers the sale of products marketed under the RITZENHOFF brand name in over 100 countries worldwide. RITZENHOFF works very closely with a large number of internationally renowned designers and the brand has been on the market since 1992. 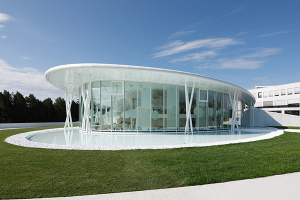 The big breakthrough for the design market was the result of an ingenious idea based on a milk glass. A whole new range of successful strategies have evolved from an idea that led to new markets more or less generating themselves. The simple but brilliant principle was to use the opaque whiteness of the milk in the glass as a canvas on which individual artists and designers can express their ideas. They don’t design new glasses, but simply create new decor for the respective standard glass form. This is industrial design too, crafted and refined with the help of an international design elite who see it as a fair, sporting (as well as lucrative) competition to take part in the realisation of an idea. The milk glass line was soon followed by colourfully decorated beer goblets, tall wheat beer glasses, beer mugs, schnapps, champagne, wine and water glasses. All these items make perfect gifts, although they soon began to attract the attention of collectors, too. It’s now possible to purchase RITZENHOFF products in over 100 countries around the world – and counting. Some interesting statistics: more than 50 collections have been created, and we now work with more than 300 artists and designers. For many years now, RITZENHOFF AG has defended its position as market leader in the field of stemmed glassware (exclusive models) for the beverage industry, with a market share of well over 50% in Germany. RITZENHOFF BV, Nieuwegein (NL) was founded on 1st January 1999 to handle sales in the Benelux countries. This is further proof of our company’s increasingly strong focus on exports and the desire to secure our future prosperity by minimizing the effects of possible economic fluctuations on the home market. In February 2005, Designer Homewares Distribution GmbH – a 100% subsidiary of RITZENHOFF AG – showcased the new brand “Maxwell & Williams” at the spring trade fair “Ambiente”. The brand is synonymous with the sale of high-quality bone china at extremely affordable prices by our specialist dealers in Germany and represents an additional line of business for RITZENHOFF AG. One of the company’s other main interests is in promotional items and B2B operations, which is primarily handled by the RITZENHOFF Special sales team. The team deals with all manner of individual customer requests. Here too, RITZENHOFF AG provides the complete spectrum of services from one single source – from product research to product design and packaging development all the way to the delivery of goods.